I used to think prickly pear cactus (Opuntia species) only grew in the desert. Now I know better. Different species of this highly adaptable plant grow all over the world, and I’ve foraged them in Wisconsin, Kentucky, New Hampshire, and Jerusalem. Foragers appreciate this plant for more than just its good looks and formidable defenses. Prickly pears have varying degrees of armor on both their pads and fruit. The pads are covered with areoles, tan colored bumps from which grow both obvious spines and almost invisible, barbed glochids. Glochids detach from the plant easily, with the mere brush of a hand. They are hard to see (and if you DO see them, they look deceptively silky-soft) and even harder to remove. Prickly pear fruit is similarly well protected. 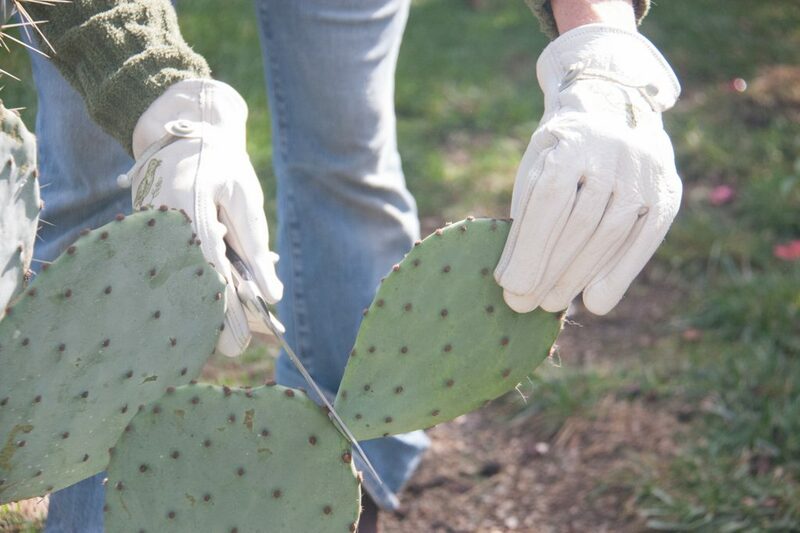 When harvesting prickly pear cactus, it’s important to protect yourself. Wear leather gloves and use tongs. Grasp the fruit with the tongs as close as possible to the spot where it joins the pad, and give it a sharp twist. To gather pads, hold the pad with one gloved hand, and use a sharp, serrated knife to cut across the bottom of the pad, leaving about an inch of the pad behind. New growth will emerge from the cut piece that remains. Prickly pear pads are called nopales in Mexican cuisine and their flavor falls somewhere on the green bean – bell pepper spectrum. Slice the pads, chop, and cook them with onions or garlic, then use them in egg dishes, stews, soups, or as a vegetable side dish. This is a highly mucilaginous vegetable (puts okra to shame); I recommend eating it cooked rather than raw. Prickly pear fruit are called tunas. When ripe they may be red, purple, orange, or yellow, and barely soft. 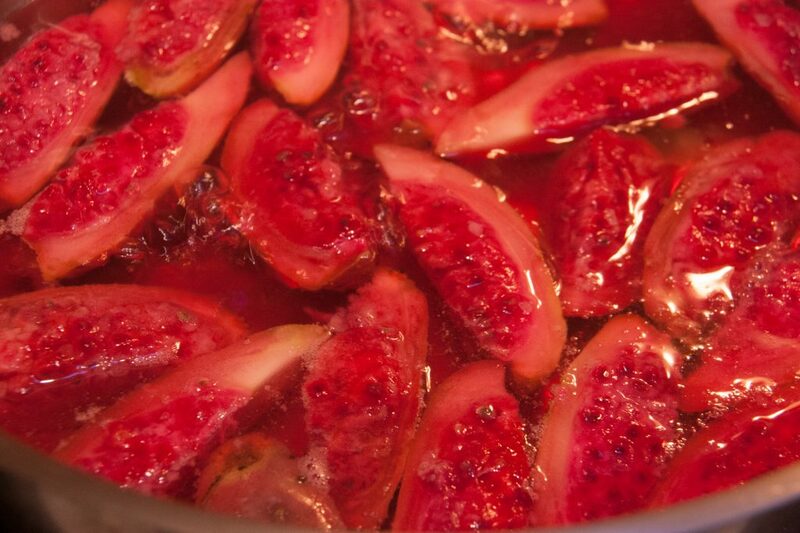 They make a gorgeous jelly, jam, syrup, sorbet, or agua fresca. The taste is unusual and difficult to describe, kind of like a watermelon – apple hybrid, but with extra texture. Store bought pads and fruit are sometimes spineless, but generally, before you can cook with prickly pear cactus, you’ll need to disarm it. Your two best weapons are fire and steel. To burn off the spines and glochids, use your tongs to hold each pad and fruit over the flame of your barbecue or gas burner, singeing the skin and burning off the spiky stuff. 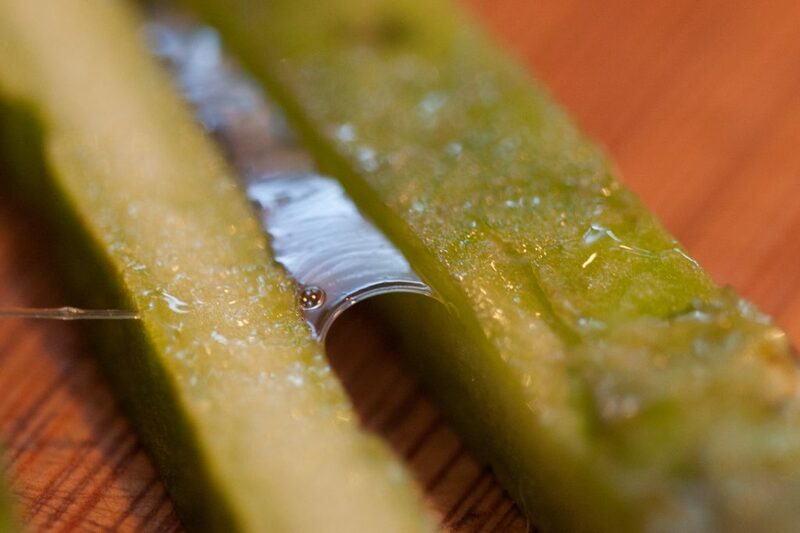 You can also peel off the spines and glochids with a knife or vegetable peeler. Wear leather gloves for this part of the process. If you’re going to use the fruit juice only (not the pulp) there’s no need to skin the fruit. Just cut each tuna into quarters (while wearing those leather gloves! ), barely cover them with water, then simmer for about ten minutes and mash to release the juices. Strain the juice, then proceed with jelly, syrup, or sorbet. Or, use a steam juicer to make the juicing process WAY easier! 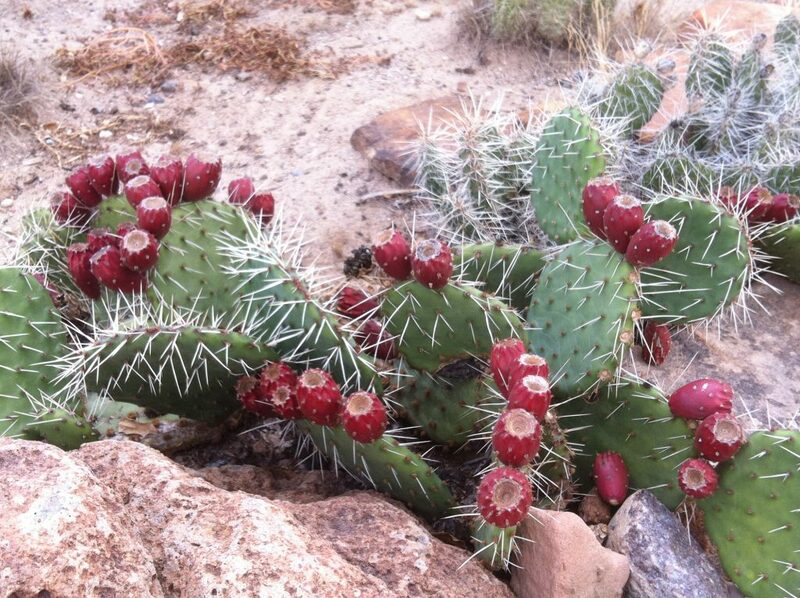 Prickly pears are an easy to identify wild food, full of flavor and nutrition. The pads contain vitamins, minerals, fiber, and essential amino acids. The fruit also contains essential fiber, vitamin C, Calcium, and antioxidents. Plus it’s super pretty and it tastes really good.